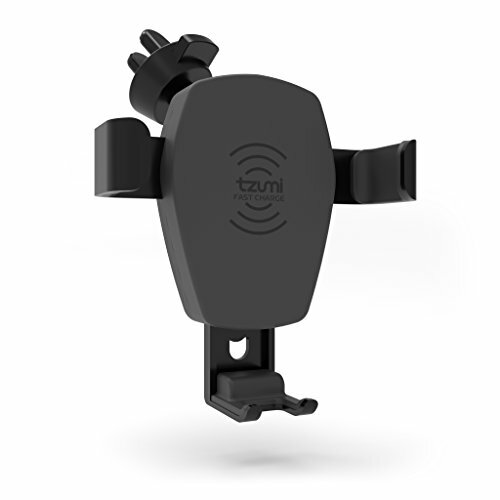 Leave distracted driving behind forever with the innovative, space-saving design of the wireless charging Gravity Mount by tzumi. By eliminating the need for manual adjustments or extra parts, docking and charging any phone is as easy as just dropping it in the holster. With one effortless motion, your smartphone is secured to the air vent of your choice, to the perfect angle of your choice. This unique smart mounting system is activated by your phone’s own weight, featuring sleek bracket arms which are pressure-activated to tighten snugly around your device. As soon as contact is made, its Qi-compatible backing provides a rapid 10-watt wireless charge to all compatible phones. Fast, Easy Phone Mounting: With the tzumi Wireless Charging Gravity Mount, docking couldn't be easier: simply slide your phone into the Gravity Mount cradle, and the weight of your phone will provide the pressure necessary to automatically lock it in place. Once your phone is docked, there are no manual adjustments to be made until you're ready to release the device, which you can do just by lifting it out of place. Suitable for Any Size: Due to its impressive adaptability, the Gravity Mount can accommodate almost any size smartphone for steady docking and improved hands-free driving safety. Depending on your preferred angle, adjust by rotating freely on a built-in swivel ball to find your favorite viewing position. Silicone lines the vent clip for a tight, shock-absorbent fit - so you'll never have to worry about charging interruption or slipping from potholes or bumpy roads. Rapid Wireless Charging: The Gravity Mount utilizes a single Qi induction charging coil, which is universally compatible with any Qi-enabled wireless charging smartphone. Powered by the Micro-USB cable and DC adapter included with every unit, the cradle will support instant 10-watt charging upon contact and serves as a stable, reliable dock mount for any kind of smartphone. Elegant, Space-Saving Technology: With its sleek and modern design, the Gravity Mount is able to hold your phone without magnets or any other extra parts. Mounted from your air vent, the mount also ensures full safe visibility on the road for comfortable hands-free functionality without obstructing your view. The unit also allows for full tapping functionality while your phone is docked and charging. The tzumi Promise: At tzumi, we are committed to providing you with the very best in consumer electronics products. We're convinced you will be more than happy with your Gravity Mount Auto Air Vent Charger, but if you are unsatisfied for any reason, please contact us directly so that we can be of assistance and make it right.